Fight or Beer Flight? How bout both! Don’t Fight for a Table-Reserve One with Boston’s. That money belt tho. Check it out HERE. Join Boston’s Arena District on Saturday, August 26 for the event everyone will be talking about, the Floyd Mayweather vs. Conor McGregor fight! Boston’s is pre-selling bar tables for $100 and bar seats for $25. They are only selling tickets in the bar for the number of seats that they have, so space is limited. By reserving now, you can avoid fighting for a table or fighting the crowds as Boston’s will be closed to the general public at 8pm and reopening at 8:30 for only those who have reserved their table/bar stools. Columbus Summer Beerfest at Express Live! What an exciting weekend of fight and flights! Kick off the weekend with Express Live for COLUMBUS SUMMER BEERFEST! Like last year, the event is held both inside and outside of the venue!! This year’s selection includes hundreds of Craft Beers that represent our local beer as well as brews from all over the country. Plenty of great local food trucks onsite, live music & more! This is the BIGGEST craft beer party of Summer, don’t miss out. Must be 21 or older for entry. Click HERE to buy tickets. Nada is featuring pork belly tacos (with an egg) this week and they look delicious! Stop into Nada for Taco’s and present your resident VIP card for a side of FREE original queso! Not Living in the Action Yet? Arena District Living offers modern apartments for a modern lifestyle. Looking for a new place to live? Want to avoid the suburbs, a mass amount of chain restaurants and cookie cutter living? Arena Crossing, Flats on Vine and Flats II offer modern apartments in the heart of the Arena District. The Arena District is a short commute away from the Short North and Victorian Village and just a quick walk from CBJ games, Columbus Clippers games, Concerts at Express Live and a number of restaurants. The communities also stand out from the rest with their resident FREE resident VIP membership that unlocks special neighborhood discounts to both the Arena District and Grandview Yard and their constant effort towards unmatched customer service. Click Here to learn more about Columbus Downtown Apartments. Check out Arena District news and things to do downtown this month. Coming to the District- a chef driven menu of gourmet burgers, and 60 taps for craft beer! Sign up for CBJ Flag Bearer Access! Flag Bearer Access includes CBJ regular ticket presale, news and videos, prized & more! What’s Happening this Month in the Arena District? Weekend Warriors- What to do in the District. An Opening Ceremony will be held on Today, August 4 at McFerson Commons and North Bank Park from 3:00 p.m. to 9:00 p.m. This is also when most of the riders will be checking in their gear, browsing vendor booths, and enjoying a dinner buffet. The Opening Ceremony program begins at 7:00 p.m. The area surrounding McFerson Commons and North Bank Park will have temporary expo tents, seating, vendors, and a corral for riders’ bikes. This was previously held at the Columbus Commons and moved to the Arena District this year. 5:30 a.m. to 9:00 a.m.
Click HERE to get tickets at Express Live. Don’t forget to take your cards out this weekend and save $$$! Learn more about Arena District neighborhood membership HERE. An offshoot of a Dublin restaurant is bringing craft beer and burgers to the Arena District. Half Pint Columbus is coming to 415 Front St. on the ground floor of one of the Arena Crossing apartment buildings next to R Bar. 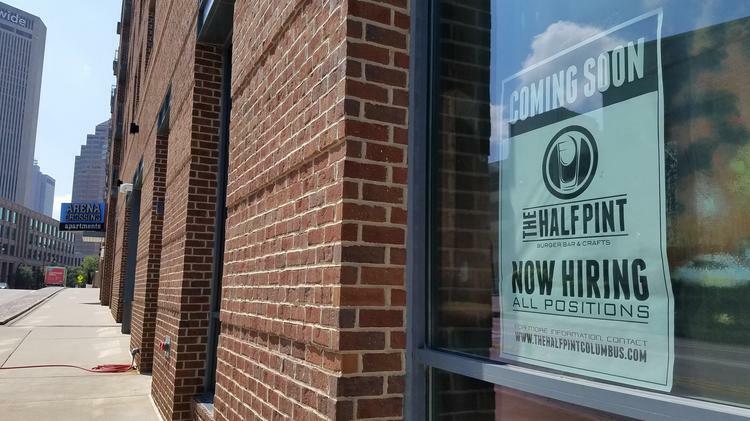 Half Pint Columbus is coming to 415 Front St. in the Arena District. I haven’t yet been able to talk to its owner/operators, but hiring has begun and work is underway on the space. A Craigslist advertisement links it to the Pint Room, which opened in the Shoppes at River Ridge in Dublin five years ago. The company since has expanded to Littleton, Colorado, as the Pint Room and added a restaurant in Marysville under the Half Pint name. The Arena District spot will have a chef-driven menu of gourmet burgers and 60 taps for craft beer, according to the posting. While that’s a lot of beer, it’s still well short of the 101 on tap at the original Pint Room. Maybe that’s why it’s called the Half Pint? Dan Eaton covers restaurants, retail and the business of beer for Columbus Business First. There’s a lot of ways to Experience Columbus, check out this list of Tours! In downtown Columbus, Ohio there is so much to explore! Residents of the Arena District not only have many walk-able amenities including walk-able restaurants, bars and entertainment options- they are just minutes away from the Short North and Victorian Village. What sets the Arena District apart? When you live at Arena Crossing, Flats on Vine or Flats II you also get a special VIP membership upon move in. In addition to 19 other local businesses between Arena District and Grandview Yard the residents also get a special discount at Experience Columbus which includes 20% off your purchase at the visitors center. For more information on Arena District Living Resident VIP Click HERE.